The Peoria are an Algonquian people, whose ancestors came from what is now Illinois, Michigan, Missouri, and Ohio. Their history goes back as far as what was once part of the Cahokia culture of Moundbuilders. The name “Peoria” comes from their name for themselves in the Illinois language, Peewaareewa, meaning “Comes carrying a pack on his back. 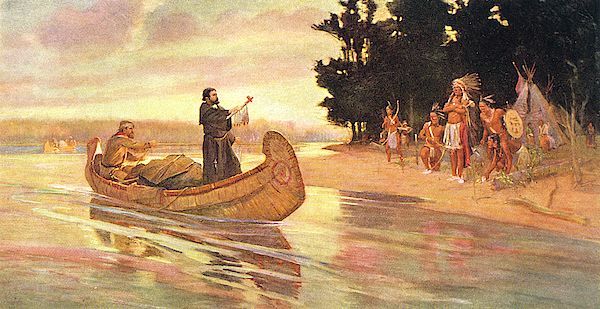 The Peoria were one of the many Illinois tribes encountered by the explorers, Father Jacques Marquette and Louis Jolliet. Later, French Jesuit missionaries converted tribal members to Roman Catholicism. By the mid-1700s, they began to migrate into Missouri Territory. In 1818, the Treaty of Edwardsville forced them to cede their lands in Illinois and the Treaty of Lewisville, in 1832, ceded their Missouri lands in exchange for land in Kansas, near the Osage River. 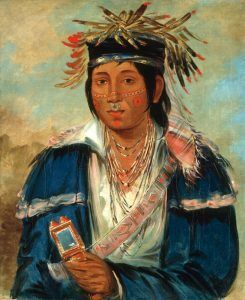 Disease and war drastically reduced the tribe’s numbers, so the members of the Kaskaskia, Peoria, Piankashaw, and Wea tribes formed a confederacy under the Peoria name in 1854. After the Civil War, most of the confederated tribe signed the 1867 Omnibus Treaty, which purchased land from the Quapaw tribe and relocated the majority of the tribe from Kansas to Indian Territory (Oklahoma). The lands of the Confederation members in the Indian Territory were subject to the provisions of the General Allotment Act of 1887. The allotment of all the tribal land was made by 1893, and by 1915, the tribe had no tribal lands or any lands in restricted status. Today, the federally-recognized tribe is based in Miami, Oklahoma and has more than 2800 tribal members.